The Don Valley is routinely overlooked in accounts of Toronto’s development. Reclaiming the Don unearths a lost chapter in the story of the city’s relationship with its natural environment. In an engaging, accessible fashion, Jennifer Bonnell traces the valley’s evolution from the founding of York in the 1790s to the construction of the Don Valley Parkway during the 1960s and up to the present day. For the past two centuries, the Don has served as both a sink for wastes and a site for numerous improvement schemes. By chronicling how successive generations of Toronto residents have imagined the Don Valley as an opportunity, an eyesore and a refuge, Reclaiming the Don provides a fascinating account of how a small river can shape the growth of a big city. 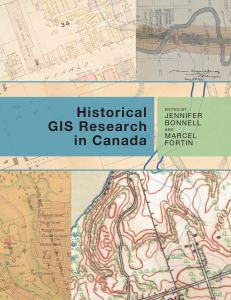 Jennifer L. Bonnell is the author of Reclaiming the Don: An Environmental History of Toronto’s Don River Valley (University of Toronto Press, 2014) and the editor, with Marcel Fortin, of Historical GIS Research in Canada (University of Calgary Press, 2014).